The analogy goes that your boat is your house and your dinghy is your car. If the analogy continues, then that would be the marina would be your neighborhood. In this post, we’re going to look at what a diverse and odd and functional neighborhood that is. Like hotels or anything else, marinas vary in niceness, and that tends to correlate with price. Typically, you are charged by the foot of your boat. So it might be $1.50 per foot per night. So your 30-foot boat will cost you about $45 each night. 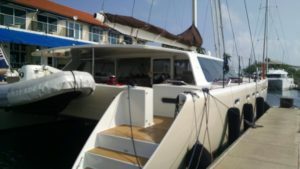 If you have a super big boat, let’s say over 60 feet, you might get charged more; if you have a catamaran (a sailboat with two hulls instead of just one), you also get charged more. For that you get a slip (think a parking space) in the marina, access to all the amenities of the marina (more on that in a second), and water and power for your boat. The water tends to be free, unless you really go crazy with it. The power on the other hand is quite expensive, at about $0.25-0.40 per kWh. Just to put that in perspective, in North Carolina we pay about $0.10, and even in California we paid about $0.15. So it gets pricy there. At a basic level, the marina acts as your neighborhood in the literal, practical sense. You dock your boat up to a slip (think a parking spot) on the pier, and that’s where you’ll stay for the time you’re in the marina. The piers act like streets, connecting you to all your neighbor boats as well as to the land. On land you have a mix of shops and amenities that seem like them come from a strip mall, a hotel, and an auto repair shop. This is part of the small convenience store. Notice half the shelf space is dedicated to liquor. Like any neighborhood, you have your grocery store, gas station, and restaurants. And all that is there at your marina. The grocery stores are more like convenience stores, smaller overall but outsized liquor sections (more on the “drinking culture” of the sailing community in the next post). 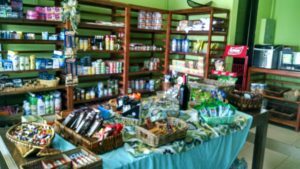 Like all convenience stores, the selection tends to be limited and prices tend to be higher, but you can get most of your food and toiletry items there. There are also gas stations, but in a marina you can easily imagine that everything is set up to fill up boats instead of cars. Then you have at least one restaurant but probably a couple that, similar to many neighborhoods, act as the central gathering point for socializing. You also have all the amenities of a hotel. In fact, many marinas are attached to hotels and there is a reciprocal agreement where being in the marina gives you access to all the hotel “stuff”. 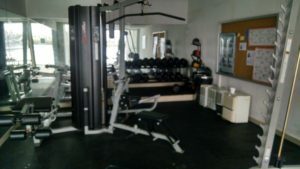 There’s usually a pool and workout room. Just like with hotels, the nicer marinas will also have spa type areas. Plus there are more practical things like laundry facilities and shower facilities. That last one is important because the showers on boats aren’t that “user-friendly” so when you have the chance to take a shower with good water pressure on solid ground, that’s a no-brainer. A third major component of the marina is the boat yard. As Jim said, “when you sail, something is always breaking.” So when you’re in the marina that’s when a lot of people do the repairs they need. It can be little stuff like fixing wiring or changing the oil in your motor, or stuff like that. Or it can be extreme stuff like doing a total haul out (where your boat is taken out of the water and held on stilts. This is when major repairs are done as well as repainting the bottom of your boat (something you need to do every few years). This whole repair component is a bit odd in that the marina, like a nice hotel, tries to convey a sense of luxury. But then a few feet away you have grimy workmen doing the sweaty and dirty work of boat maintenance. While we were in the marina, what struck me was this neighborhood was incredibly diverse. Obviously there is a lot of national diversity (more on this in my next post), but what was fascinating was the diversity of the types of boats from an “expensive” point of view. 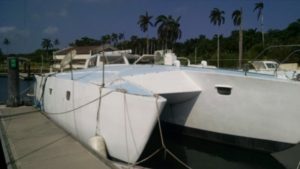 This was the nicest boat in the marina–a 60+foot catamaran which people estimated cost $5 million or so. In most neighborhoods, the houses all are similar—in size, in cost, etc. It would be weird to see a $5 million mansion on 5 acres next door to a tenement apartment that looks like it might fall down any day. But in the marina, you kind of have that. There are amazingly nice yachts that cost $5 million or more. They are sitting next to tiny, beaten-up boats that might not even fetch $10,000. And there are all sorts in between. This is a solid middle class boat. Also, there are hugely different purposes for the boats. 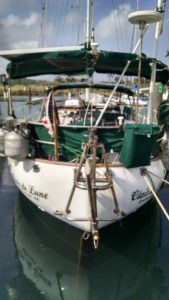 Most are like Jim and Laura’s where they are very seaworthy (obviously because we made the 800 mile trip), but they spend 90% of their time in the marina. 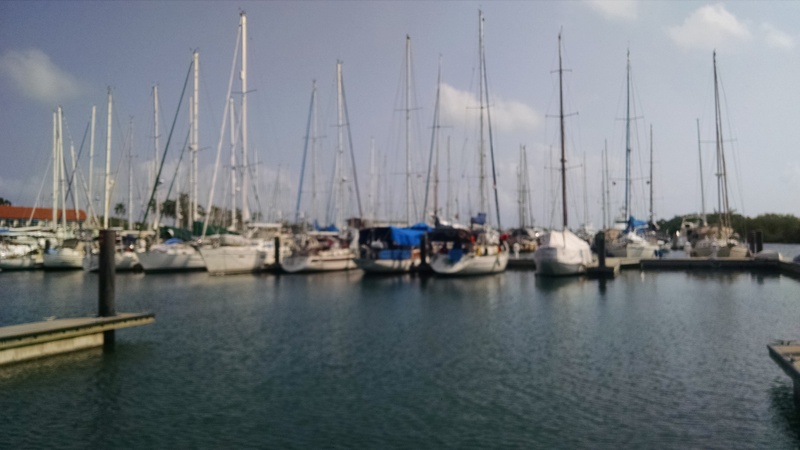 Other boats are just in the marina to get provisions, get something fixed, or whatever and then they are off again. Then a third category are non-seaworthy boats where the owners have decided they are going to permanently live on their boat in the marina. As you can imagine, that leads to a very diverse range of boats that connect to an equally diverse set of sailors. This eyesore was disassembled (no most to sail with) so it can never sail again. It just permanently sits in the marina with its crew living on it. Finally, just by virtue of the fact that for most boats, the marina is not a permanent stopping point, there are always different people and different types of boats coming in and out. It sort of reminds me of the hustle and bustle of a city like Chicago or New York, but of course, in those cities the buildings are picking up and leaving after a couple days. I say all this because on land so many of us are so isolated in terms of that diversity. We live in houses that look like everyone else’s, and we tend to live near people who are similar to us in terms of income, education, stage of life, etc. The marina is really the opposite of that, and it was totally fascinating. Even more fascinating is that diversity in the marina leads to an incredibly rich, although somewhat frustrating, mix of fun and interesting people.